My friend Anne is at it again, upping the garden bar for those of us who watch her, admiringly, from afar. She took the plunge into “Back to Eden” gardening last spring, ordering loads of wood chips to be dumped on her garden space, roping her good natured husband and two beautiful daughters into getting their hands into the mulch too, crossing her fingers, praying and listening, planting and watering, and watching with hope for green. It was Anne’s big garden experiment, driven by her garden experience of the year before, that common experience so many of us face in late summer: losing vast swaths of the garden to weeds. And it was a successful experiment: Anne’s garden turned out to be a thing of order and beauty and fruitfulness, and I loved it that she shared it with me. And, of course, with Anne’s permission, I shared it with you. 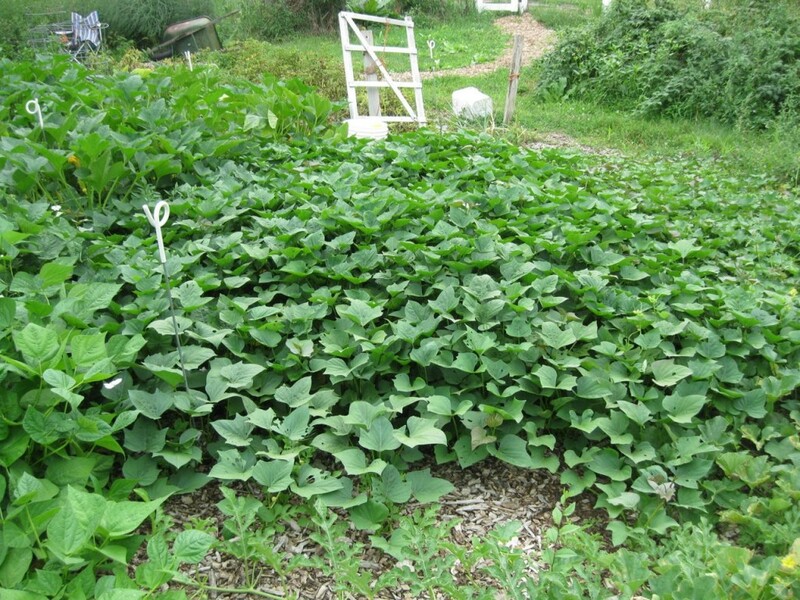 I wrote later last fall about Anne’s amazing sweet potatoes harvest–check it out! “Back to Eden” gardening worked! Anne discovered that for herself. 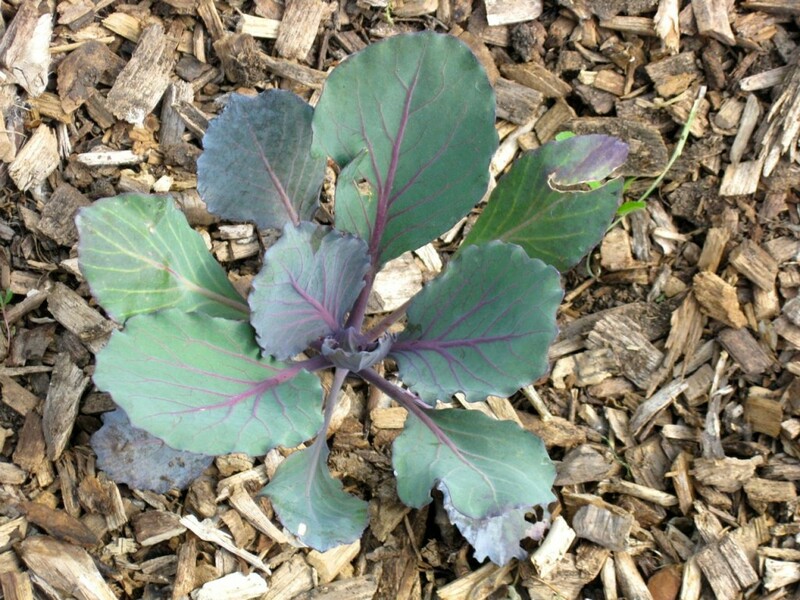 Paul Gautschi’s gardening methods are pretty fascinating to those of us (cough) who struggle with weeds, especially this time of year, not to mention those of us who struggle to keep the garden well watered. If you are a typical gardener, you understand the dilemma this time of year: you’re not sure whether you should grab the hoe, your gloves for pulling weeds, or just get the mower out and mow the garden down. If you’re interested in gardening with lots of mulch and very few weeds, then be sure to take a look at the film on Paul’s website. Be be forewarned: it’s pretty exciting, if you’re a garden geek like me. Don’t watch it right before bedtime. It’ll keep you awake, and you may drag out way too early the next morning, ready to go find yourself a mountain of wood chips for your own garden. 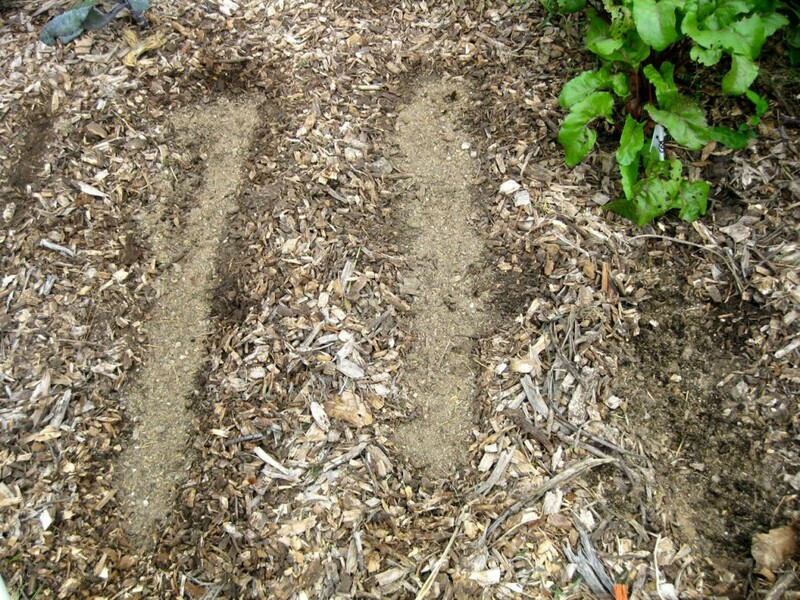 Paul’s method is fairly simple: he lays out a layer of cardboard or newspaper over his garden space, and then covers it with mulch (he says to use whatever you have available, although he uses wood chips). 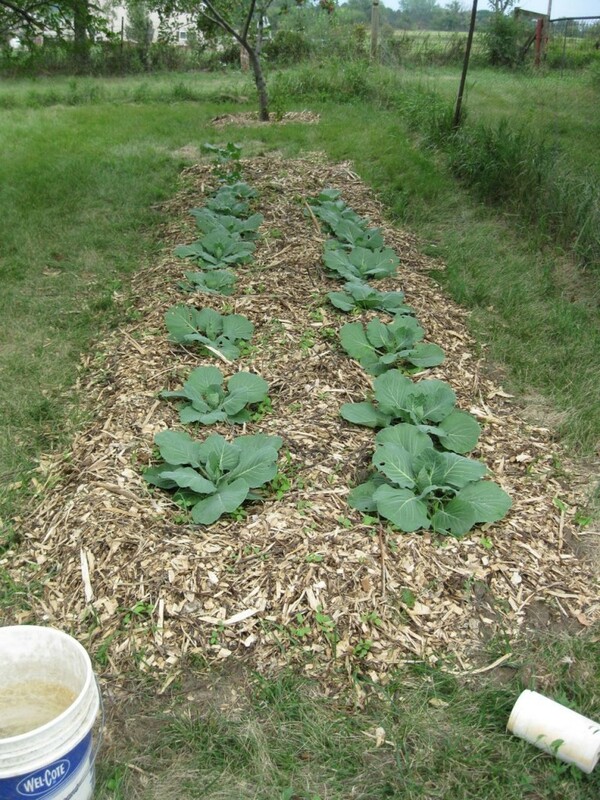 The mulch keeps the moisture in, keeps the weeds from growing, and gradually decomposes, adding nutrients to the soil. It’s a beautiful system. I love it that Paul also is a believer, and prays over his garden and listens to what God has to say to him there. I have no doubt that this is a vital part of his success! In my own gardening, I’ve done this very fun thing in specific areas–primarily in the hoop house, and the flower beds around the house–but I’ve never wrangled enough wood chips at one time to do all my garden spaces this way. I have a lot of garden spaces. 🙂 But every fall, when the weeds are proving to be a frustration to me, I grit my teeth and determine to find a large quantity of wood chips next spring. I was very curious about how Anne’s “Back to Eden” Garden would be, during this, its second year. Anne had told me earlier this summer that because of our cool, wet spring, her garden got off to a bit of a slow start. Anne very obligingly took pictures of the garden in the early spring, so you can see what the early plantings look like, and then later in the summer, too. Here are the pictures and an interview I did with Anne. All photos are used with Anne’s permission. Q: How did your spring planting go this year, Anne? Anne: The actual planting was much like last year, but I planted with much more confidence. We were also much earlier, as the wood chips were already down, so I didn’t feel behind. Yay! Q: Did you have to replenish the wood chips, for the second year garden? Anne: We stirred them around a bit and added to any spots that seemed thin. We had four naughty chickens that flew over the fence all winter long. They were very busy and left things a bit untidy. They fertilized quite nicely, however, so I shall not complain. Me: Chickens are so awesome. 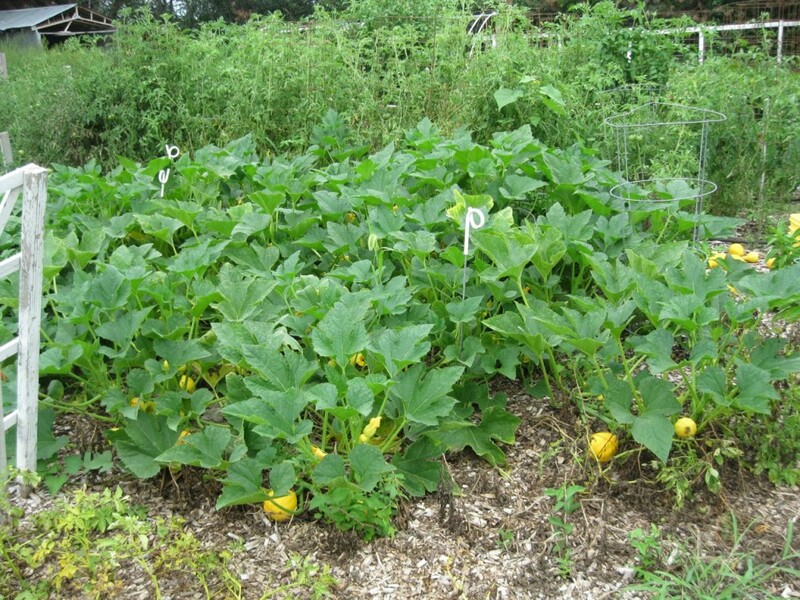 Anne: We also extended one end to accommodate more winter squash. We have a small plot next to the big garden, and have started connecting the two. One of our neighbors discovered a tree trimmer in town for the summer who had been taking all of his wood chips to the city dump. Gasp!!! So, he was promptly invited to start dumping beside our garden, and our neighbor can just come over and take as needed. Me: (after coming to, several minutes later) (clearing throat) My, that was (cough) generous of you. Q: Any particular challenges that springtime brought, particularly ones that you didn’t foresee? Anne: We had a hailstorm in early June. Luckily we had enough buckets to cover the tomato plants. And we just put plastic over the cabbage, broccoli and brussel sprouts. The peppers had cages on them, which seemed to protect them some. They grew back. All but two of the sweet potatoes that got broken off grew back. Probably a third of the plants were just stems after the hail. Anne: I cannot recall anything related to the wood chips. We did have a few more weeds than last year to contend with, but they hardly count. I can’t say I spent hours weeding daily in my garden. I’d pull one here, pull one there. I would almost describe it as relaxing. Q: What would you say were the primary benefits of a second year, thick layer of mulch? Anything different from the first year that you can share with us? Anne: My cilantro and some of my flowers reseeded. It was the most amazing thing to me. Baby cilantro all over the garden. In fact, the seed has germinated in stages all summer long, so I still have baby cilantro growing in my garden. 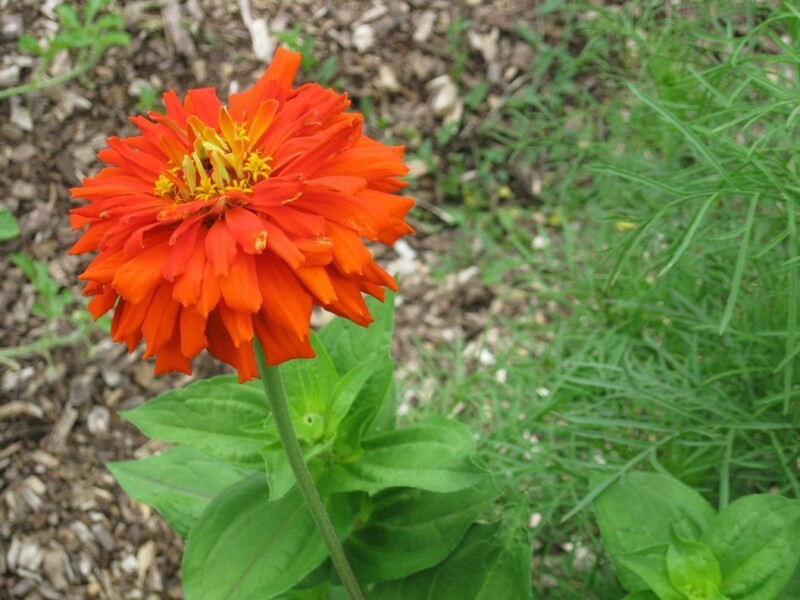 And I got my flowers planted very late, so it was nice to have a few early ones that I had nothing to do with but pick. In years past, all of this would have been lost to the tilling and the weeds. Me: Whoa. Baby cilantro. What a gift! I always want fresh cilantro in the fall, when I’m making salsa, but mine has bolted, lo, months ago. But you’ve got a steady supply, apparently. Me: So. Can I come over and get some cilantro? Anne: If you say please. Pretty please is even better. Q: Anne, is there anything that you would have done differently this year, if you had it to do over again? Anne: I would plant my flowers earlier. The planting is just more labor intensive, so I put it off too long. Q: We share an insane intense love for heirloom tomatoes. How did your tomatoes do this year? 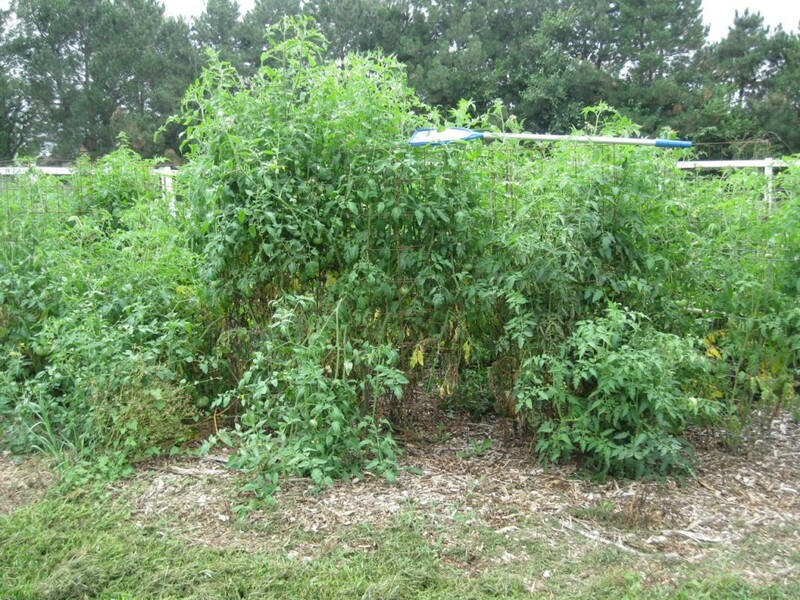 Anne: My tomato plants got off to a bit of a slow start–I think most gardeners in Nebraska experienced the same thing, though–but they are doing great now! Anne: I planted plenty of lemon squash, a summer variety, because the squash borer moth always gets my squashes. Well, I faithfully scrubbed its stems, and they sort of took over that part of the garden. This is a new experience for me. Me: Well. They do look much better than my lemon squash plants, Anne. I’m a bit jealous here. 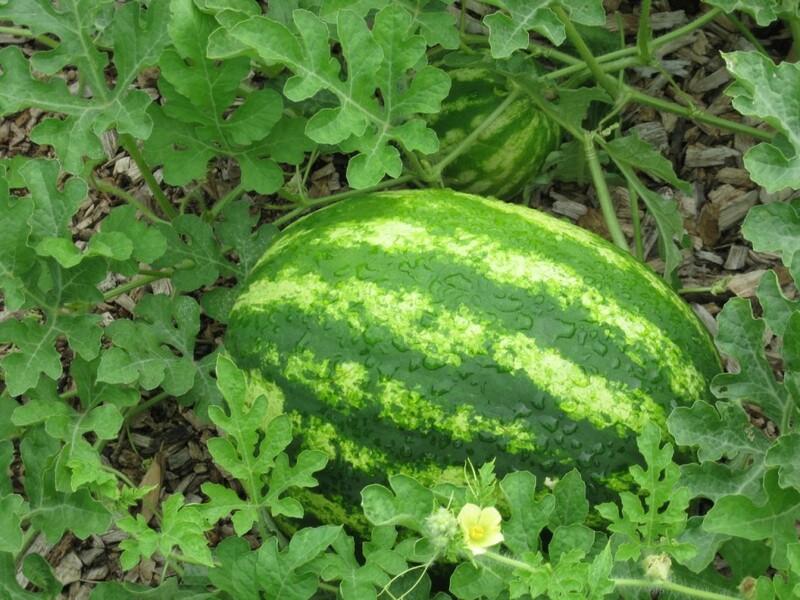 Q: Whoa, those are some beautiful watermelons! What variety did you plant? Anne: I ordered plants from Azure and I don’t remember what they are. But aren’t those water droplets on the melon lovely? Q: You mentioned in last fall’s interview that you were thinking about expanding your “Back to Eden” garden. So . . . did you? 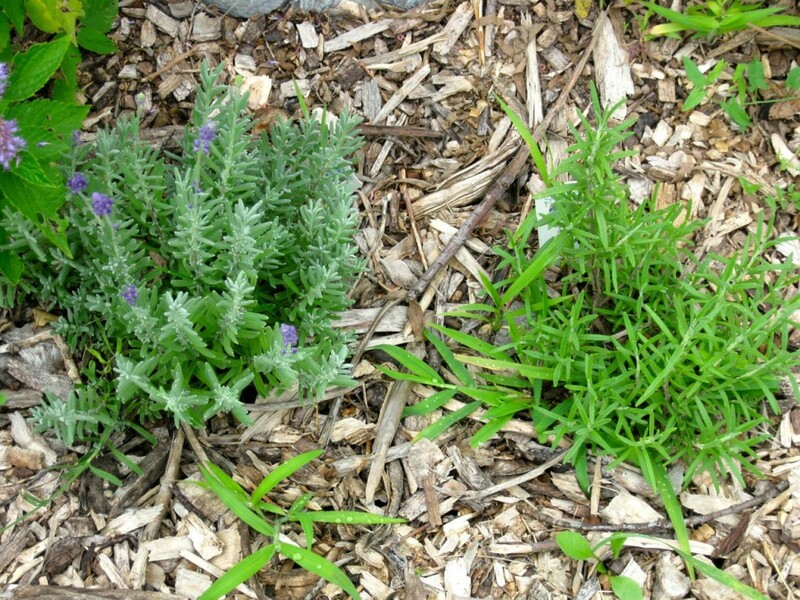 Anne: Sarah (Anne and Boyd’s youngest daughter) begged all winter long for her own herb garden. “And please let it be somewhere besides your garden.” We settled on the orchard. She sits in the orchard and writes. She also named all the fruit trees. This is her space. I should have taken pictures before today, as it is looking a little season endish. We have been so blessed by this beautiful little collection. Q: How lovely! Can I come join Sarah in her quiet spot someday? It sounds like a perfect place to write! Anne: Sarah would welcome you in her quiet spot any day. She has the bench ready for you. Seriously. She’s serious. Me: My. Somebody very generous and interesting must have given you that anise hyssop plant, hmmm? Anne: We also decided, due to the cabbage moth population in the big garden, to plant our fall crop of cabbage and broccoli in the orchard. This also forced us to get it ready so that Sarah can have a flower garden in that spot next spring without having to wait until we ‘get around to it’. You know how that is. Me: Oh yes. And those cabbage moths–I loathe them! I spit on them! I . . . I . . . I know how that is. Anne: I still find planting seeds especially labor intensive in the wood chips. So, I came up with a new method. I carefully move the wood chips over to expose the soil, put the seeds right on top, and then take well composted soil from the chicken house and cover the seed. Before, I was trying to dig up the existing soil enough to plant and cover the seed. The new process makes planting seed much more enjoyable. I took this picture before watering in the seed so that you could see the chicken gold. Me: Impressive! And we’re back to how awesome chickens are. Anne: (laughing) Oh! And one more thing–I planted a much bigger fall garden this year, too! Me: Viva la “Back to Eden” Garden! I want to thank Anne again for being so sweet and generous in providing all these photos, and for inspiring me anew! Her garden is just beautiful, and is a real inspiration to me! I hope it has been to you, too. AND I’m linking up this post with the cool folks over at The Prairie Homestead and their fun Barn Hop. Join me! Not to mention . . . I’m linking up with that Wednesday online home-affirming party, the Home Matters Linky Party. Come and see! Such lovely photos and a beautiful garden! One of these days I’ll have to give this Back to Eden gardening a try. I think it’s worth the effort, Katie! Yes, I have to agree with Anne, it is so nice to go out into the garden and see just a few weeds and so nicely being able to pull them up. The biggest plus that I have seen so far with the BTE method is that I don’t have to spend time pulling weeds (plus lots of worms) but instead tend to the garden in planting the new crop for the season. Ohhh so wonderful! God is GOOD! My ginger is coming up! How about yours? Just planted Roma beans and they’re peeking out. My green peppers are coming back after being chewed on by Mr. Green Horn and high heat this summer. The eggplants are beautiful. I have a friend that has chicken and she gives me her good old poop in a bucket and I water it down. Letting it ferment for a while, seems to work good, and then I cut it in half w/ water before I put it around the plants. They seem to love it. It’s nice that you don’t have to do that, having chickens! I tried sweet potato leaves for the first time and love them. Very tender and knowing that we don’t have any really greens in the summer, I may have to plant some extra sweet potatoes next year just for their leaves! Nothing like having greens in the summer! They are very expensive at the market here…around $5-6 a lb. Gotta run…gardens waiting! Happy gardening! I always forget that sweet potato leaves are edible. YES my ginger is growing! It’s in the hoop house and I watch it very carefully. It’s not exactly lush but it’s alive. It seems to be a very . . . slow . . . grower. Happy gardening to you too, Rose! Yes, it’s a very S L O W grower! Now’s the time to give it a little fertilizer. Love those chickens! I’m ahead of you climate wise so it should start to grow pretty fast once it’s up! I pulled my new ginger out last season and put the biggest ones directly back and it made it through the winter which surprised me! Did you do the same? I did add a LOT of mulch on top, to keep it warm in the winter! This is the first time I’ve grown it, but since it’s in the hoop house (in a very pampered corner) I’m going to try to do the same. I’ll also fertilize this week, per your suggestions, and while I’m at it I’m going to fertilize the tomatoes in there. They are beginning to need it! Thanks for the suggestions! Lovely to see you here again, Amy! I have always used the “Paul Method” but you’ve inspired me to try the “Anne Method”. Great Post! Great pics. I really wish I had a garden again. 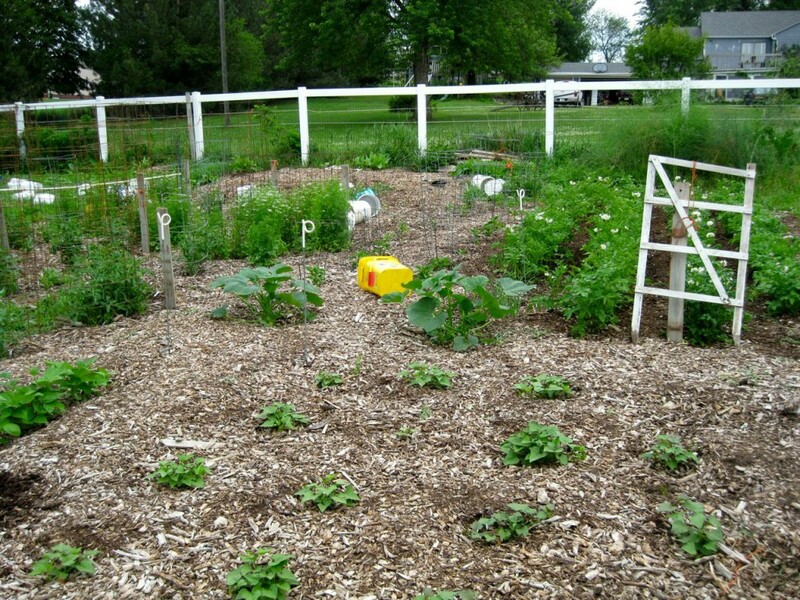 I’d so grow loads of veg. Nick, start small! You can grow loads of veg in a very small space! And, it looks so organized! What a beautiful garden. I would so love to walk there, sit there and meditate. Mulch and love are the keys. Donna, I agree with you! It just looks so peaceful! 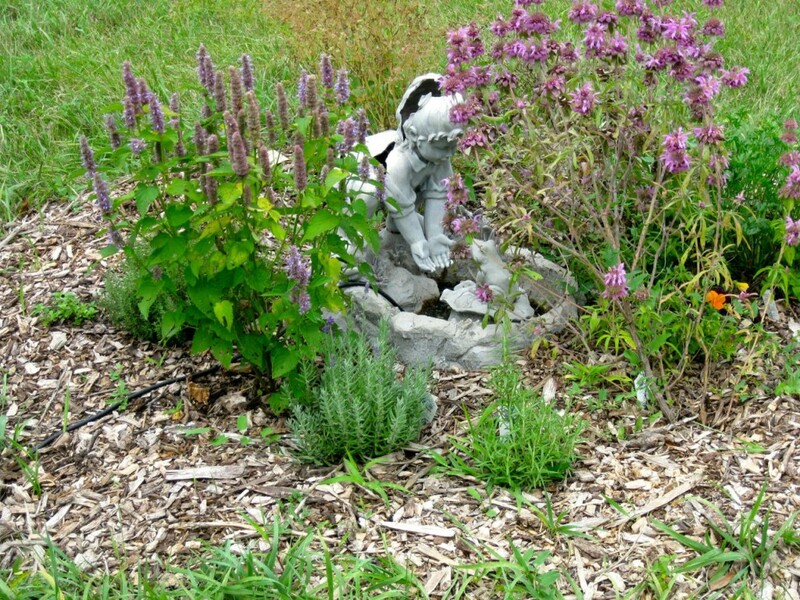 I am so intrigued with Paul’s gardening style. I have watched his video 20 times and I still haven’t made the move to do this. What I did do was to plant okra where my mulch was heavy. It didn’t like it! I need to watch the video one more time – or 10! I have actually watched the Back to Eden video. I made a minor attempt of implementing that method around some tiny little hydrangea bushes I planted. They were struggling in the extreme heat here in the south. I did not plant them in their preferred shady location. They are doing well, and show nice promise for next year. They have actually grown a little bit. I’m not much of a vegetable gardener but I love reading about it and dreaming of doing it! Thank you so much for sharing with us at Home Matters! I pinned your post twice; to the Home Matters board and my Yard & Garden Board. I see you have put down your paper and mulch, but just how do you plant your seeds. Sheila, I use the area of the garden where I’ve put down paper and mulch to plant starter plants–peppers, tomatoes, eggplants, etc. If I need to plant seeds there, I’ll scrape aside the mulch to get to the garden soil underneath.